I won the Run4Troops Saturday. I covered the Heritage Trail faster than anyone else known. That's not saying much because I know of three people in Iowa that could pop a sub 2:40 tomorrow if they wanted. I've run 2:30, so 2:47 is really no big deal. Regardless 2:30 is no big deal either. I quit reading the results at major marathons before I get to 2:30. What does it mean to win a marathon? There were only 108 individuals in the race so I suppose that once again puts me in the fastest 1%. Not 1% of people mind you, 1% of marathoners. Not all people even attain marathoner status. It's past my bedtime so much for the philosophical and on with the physical. 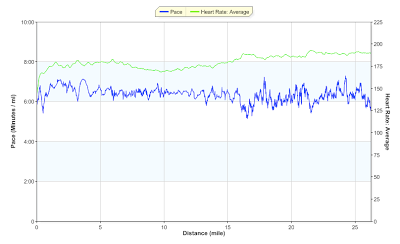 This is my GPS data of pace and heart rate for the race. I hope you like it because the heart rate monitor chaffed my chest and now I have a burn/scab an inch long on my sternum. You can forget me doing this in any serious marathon. I executed the plan quite well. 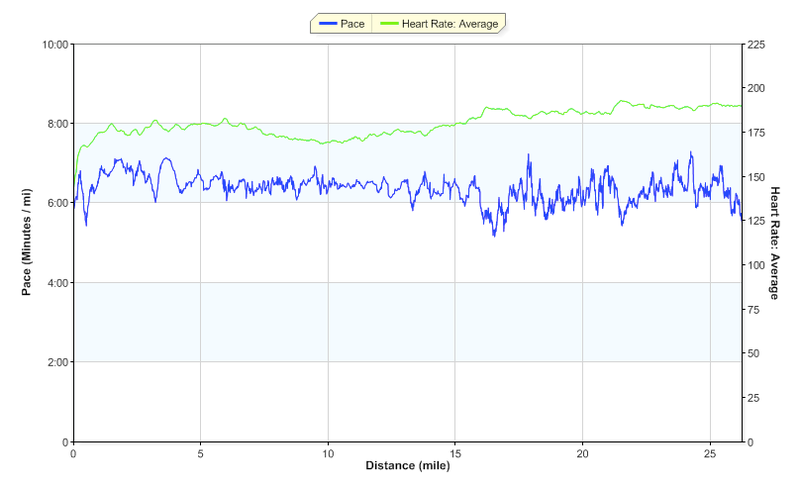 The first mile was 6:20 way too fast but I stayed relaxed the first 16 miles as planned before dropping the pace under 6 and upping the heart rate as shown above. In that 17th mile I moved from 4th to 2nd. Then right after mile 22 I moved into first with a jerk move. I eased up beside the leader and ran stride for stride with him for a bit before taking off 30s a mile faster just before the checkpoint. Regardless, I did what I set out to do. I did struggle the last three miles. This felt more like a long run than a race. I mean, I have worked roughly as hard in other long runs and struggled even worse in the later miles of long runs that a few 6:30s near the end isn't the end of the world to me. People wonder what I think about while running for nearly three hours. I spent a lot of time thinking about pacing and drinking fluids and keeping my upper body relaxed. However, in this race I spent part of the race talking to other racers including a 22 year old that fell apart later in the race. A marathon is hard! I spent quite a bit of time thanking God for the blessing of being able to run this far healthy. There have been times when I was worried that my running might end, and it was going plenty strong Saturday. I am so blessed. Finally, here is a video of me with a little less than three miles left. I was not feeling great at this point. Your are in the top 1% of Marathoners who were at your race. You are not in the top 1% of all Marathoners. Just think you should put your comment within an accurate context. Congrats on the race though - well done! Congrats on winning the marathon, Isaiah! Anonymous, at CIM in December 2011 I was 40th of 5756 marathon finishers and in Green Bay in May 2011 I was 6th of 2055 finishers. Also, in 2011 I ran the 3621st fastest marathon time in the world, while there were over 530,000 marathon finishes in the United States. So I'm really more in the top 0.5%, but the point was to stress that once one arrives at the top 1% there are many other goals and greater challenges.